Notes: The Castle of Conversano is located on the highest point of the hill on which the city stands in a position able to dominate the whole surrounding territory to the sea, and borders the old Largo della Corte, a large irregularly shaped square always at the heart of the city life.The castle was the residence of the Counts of Conversano for almost seven centuries, ever since Norman times. Yet his story is much older, probably already at the time of Gothic War (535–554) on the same place there was a defense building, which embraced a part of the megalithic walls of the ancient city of Norba. Certainly the first Normans feudal lords in the 11th century imposed the reconstruction of a castle on the ruins of the former. Of the original Norman core is preserved today a tower with a square base, known as the Torre Maestra and a fresco on the original vault entry, depicting the saints Cosmas and Damian. Later, important extension works were made, among others, from the Counts Luxembourg (14th century) who promoted the building of high circular tower at the north, right where the ridge of the acropolis became steeper. 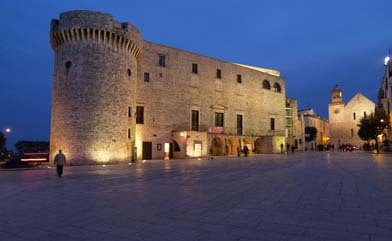 Around 1460, the Acquaviva built a twelve-sided tower base, more squat and with the embankment type walls, particularly daring from the engineering point of view: inside it, there is a round tank with a corridor around it equipped with drains, which are essential to defend the city. The following centuries saw the further transformation of the building that was gradually losing the character of the manor to configure itself as an elegant mansion, suitable to the prestige of the powerful feudal lords. The current entrance is opening along the wall on Piazza Conciliazione, built in 1710 at the behest of the Countess Dorotea Acquaviva. Is possible to access a courtyard which in turn provides access to the late Renaissance porch. Further work on building complex have followed one another until the late 19th century. The castle is currently only partially a municipal asset, while some wings - including the bridal chamber decorated with scenes from the Old Testament of Paolo Finoglio - are still private property. The public area of the building now houses the civic art gallery displaying paintings of the great cycle of the Gerusalemme Liberata always by Finoglio.